The 2009 SCCA Club Racing Season was really enjoyable. I was able to make it to seven race weekends this year plus four other high performance driving events. That is more track time in one year than the sum total of track time in my entire life before this year. I really learned a lot and set new personal best lap records almost every week. I started the year with my best lap in the MARRS 1 qualifier being a 1:37.908 and 8 of the 10 laps being slower than 1:40. I finished this year in the MARRS 11 final race with a 1:31.826. Six seconds faster in a single lap is a great improvement. More telling was the consistency of the laps in each race with many of them clustering in the 1:32 range at the end of the year. I met a lot of really great people as well. I could not have even come close to making this happen with my busy schedule if it were not for Mike Collins and his fantastic program at Meathead Racing. A huge shout out to Wendy, Sherise, Glen, and Jimmy who helped me though a huge learning curve. The other racers were also fantastic (aside from some early “rookie bumps” out on the track to initiate me to Spec Miatas). Some of these people are very accomplished racers that turn laps in the 1:27 range. Yet they will still spend time and talk with the slow pokes like me to help me learn and grow with this sport. Many of the Meathead Racing teammates also took time to help me get buckled in and ready out on the grid as well. Such an outstanding group of people to spend a weekend with! If you have ever considered learning how to race in wheel-to-wheel competition, I would highly recommend contacting Mike Collins at Meathead Racing. Even for a busy person such as myself, they make the words, “arrive and drive” a reality. I got my new TraqMate installed and used it in the MARRS 7 SCCA Club Racing event this weekend. The device is astounding. It uses a GPS to track your speed and a video camera to record what is happening in front (and optionally in back) of you. I plan to edit out a small piece of the race where a couple of cars spun out in front of me and post it here. So far the video editing software converts the whole race – all or nothing. So I will figure out what I need to do to post a15 second clip instead of a 30 minute race. This device will let me know how fast (slow in my case) I am entering each corner and what my exit speed is. This will help me compare to the really experienced drivers and know where to push it harder. The camera and GPS do not lie. And they record every lap and every missed shift. So this should be a huge help towards setting my new personal best lap record. Completed First SCCA Regional Race! Well all of the preparation and training has paid off. From the two days of Spring Driver’s School, to the PDX and Club Trials, I finally completed my first official SCCA race today! My goal was simply to finish the race – even in last place. Today I drove the #0 car I bought from Al Bell in the 2009 MARRS 1 Club Racing event (see photos below). I was still able to maintain that delicate “work / race balance” this week by holding all of my work meetings including my travel to NYC to accept the Green IT Award from the Uptime Institute for AOL. Yesterday I was at the track for the qualifying laps and the qualifying race. I did not have all of my paperwork in order to switch from the “T1” class to the “SM” class and getting this corrected all the way from registration through the timing booth cost me the qualifying laps. That meant I got less practice, and that I needed to start at the back of the pack for the qualifying race that went off at 11:00AM. But that was only the beginning of the fun. After I pinched him in turn 1, I got bumped in turn 2 and then rear-ended between turn 2 and turn 3! These guys are really serious and are not afraid to let you know they are there. Maybe it was the novice stripes on my car and their way of saying, “welcome to the SCCA”. I finished the race near the back but not dead last. I of course finished ahead of the people that crashed and could not complete the race… My fasted lap was 1:37. A full 10 seconds slower than the best of the best (only 2 people turned a 1:27 in the qualifying race). No wonder they were lapping me. I went home feeling like a rookie (if that) but with a decent sense of accomplishment. I finished the race. I set an official “personal best lap time”, and I was all set to go for the big race on Sunday. Sunday morning I made sure I was up and ready to go with plenty of time to spare. I made it to the track by 7:45AM and was able to do some prepping before the “hardship lap”. I made sure I got out on that lap and got some needed practice in. At 8:40AM we were “on grid” in pit row. I was started in position 42 in a field of 44 cars. One of the better racers on the Meathead Racing team was behind me (his car threw a piston rod through the crankcase in the qualifying lap the day before and did not finish). I let him know I was letting him by as soon as we got the green flag (and did). We were sent out on two warm up laps and given the green flag at 8:50AM. I let Brian pass me and was the sole and complete owner of last place. A comfortable place if you do not like someone in your rearview mirror as you settle in for the next 35-40 minutes of racing. Within about 20 seconds all I could see was brake lights and tire smoke. I backed off and as I went through the smoke I saw cars on each side of the track. All of this was on the first lap in front of the flag tower! I thought, “damn – these guys *are* serious”! Then I saw a crumpled “Bad Al” Bell pointing at me (wrong way) and clearly driving the car back onto the track. At least some of the folks in the pile-up were still able to re-join the race. I was surprised to see that #37 was not keeping on my tail. She was in my driver’s school and had been beating me fairly consistently. 🙁 Possibly she had car problems as after it was over, I noticed she was out after 10 laps (which still counts as a finisher of the race since she completed half or more of the laps). #8 was a different story though. We traded positions at least four more times during the race. We were each blocking the line on turn 1 and would trade positions. I was actually able to take him in turns 6 and 7 one time. That was awesome. Once he went into turn 1 too hot and went off the course. I was shocked to see he drove it back on and was behind me again a lap later. Drat! I thought I had lost him. Towards the end of the race we again went into turn 1 side-by-side. He had the inside and started turning wide. Another car had gotten inside of him (faster cars that were lapping us) and we were three across. He bumped me and pushed me off the left side of the track. I was able to hold the car steady, re-enter the track and stay on him. I passed him the next lap and was able to hold on for the remainder of the race. That was fun. We both were lapped by the fastest 19 drivers twice – but we had our own race going on – and that made it really interesting. I ended up finishing 32nd of 44 cars. Six cars did not finish due to accidents or car issues. Two other cars appeared to stop racing before the checkered flag – but after the race was official (10 laps completed). So, in the end, I finished ahead of four cars that were still on the track at the end of the race. One of the more important metrics was my fastest lap time. These can be thrown off due to other cars stealing your line, etc. The interesting thing is, I improved my fastest lap from 1:37 on Saturday to 1:34 today. It may not sound like much – but every second counts and it least it shows I am moving in the right direction. The bad news on this issue is that only three cars has slower fastest lap times. Still much work to be done there. The fastest lap was a 1:27.338 by Dean Copeland. He won the qualifying race as well yesterday. He also holds the lap record for the Spec Miata SM class. If his time stands today, he will have set a new SM class record as his previous record was 1:27.790. It must have been a really fast day (perfect weather, etc.). Five racers (including Dean) beat the previous record of 1:27.790 if their times stand as official. What a fast pack and great race. Here is a gallery of professional photos from my first SCCA race. Click on any photo to begin the gallery. 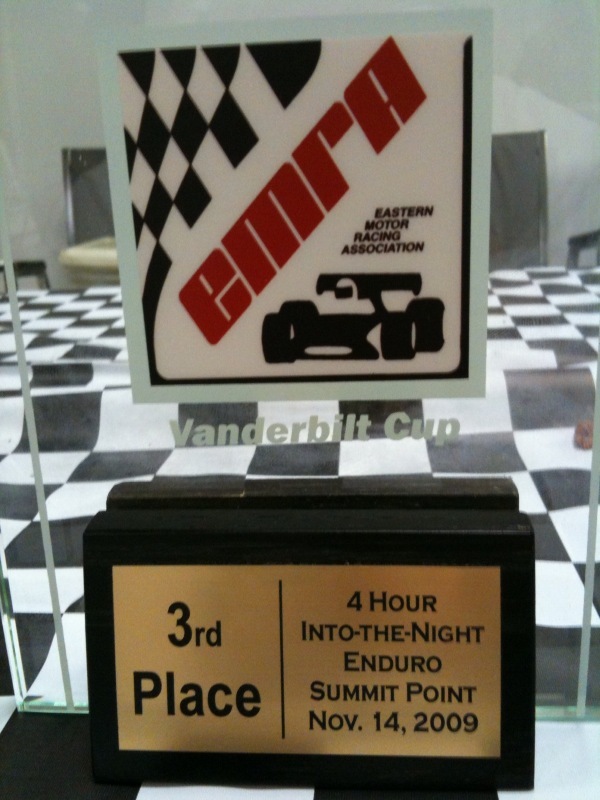 Author Ted CahallPosted on April 19, 2009 April 8, 2018 Categories Road RacingTags Road Racing, SCCA, Spec Miata, Summit Point WV, Ted Cahall1 Comment on Completed First SCCA Regional Race!